Battery monitoring and maintenance is always a must when you are using a laptop, especially when you are using an Apple Macbook. Its important to check the usage of your battery, its life and its capacity etc. when we are using a laptop, as battery makes up the main part of laptop and is the life for it. Monitoring the battery stats is not easy, if doing it directly but would be a lot easy if there is an application for that, and yeah there is one, called Battery Health Monitor which i recently mentioned about in my best macbook applications list. This application is for Apple’s various laptops like PowerBook, iBook, MacBook, and MacBook Pro. It monitors and supplies us information about the Mac battery from various aspects and parameters. A/C Power – This is an indication to show whether the laptop is connected to an external power charger or not. It is dark highlighted if the charger is connected, and not if there is no power charger attached. Battery Installed – Shows whether one or more batteries are attached in the laptop. Battery Charging – Indicates the present charging condition of one or more batteries present in the macbook. If the text is dark, then shows that the battery is being charged, if light text, then it is not charging. Raw Battery Low – This is an indication to show that the macbook is running on a reserve charging and soon the entire battery will experience scarcity. UPS Installed – This sign shows the presence of Uninterrupted power supply to the macbook. Battery Low Warn – When this shows the dark text, it means that the battery has experienced low charging. Battery Depleted – Indicates the draining out of the battery. Not Chargeable – An indication to show that the current battery that is installed can not be charged, but the reason for that is not shown. Original Capacity – This is the capacity of the battery, which it can hold and store when it is newly bought or has come with a new macbook. Current Capacity – When the battery gets older, its power storage capacity slowly decreases. And this indication is to show the current storage capacity of the battery present in the macbook. Current Charge – This parameter is to show the current charge the battery has. Charge Cycles – This shows how many times the battery is charged completely and the total count of recycles are shown. Voltage – Parameter to show the voltage supplied at the battery terminals. Installation of this application requires PowerBook G3 or later, or iBook, MacBook Pro, or MacBook and requires Mac OS X (10.1 or later). 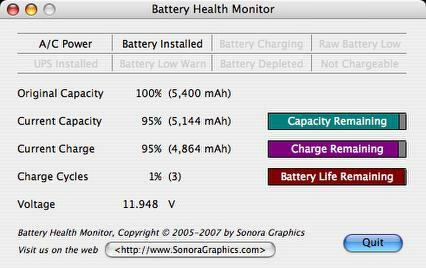 Download and more info – Check Battery Health Monitor.